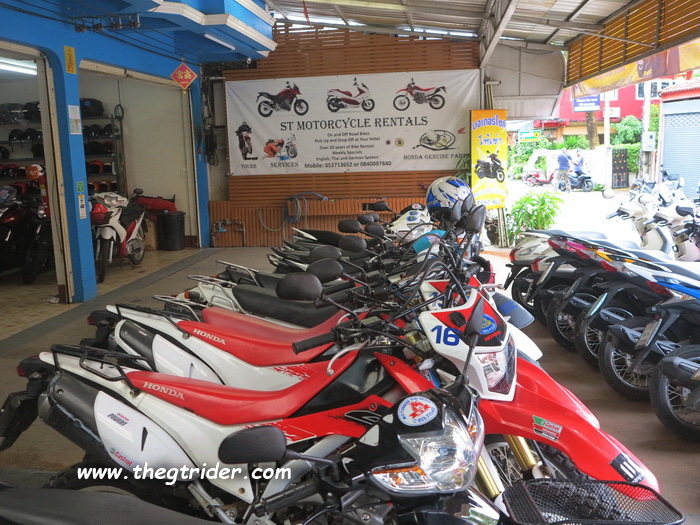 A nice mix of good condition off-road & road bikes for rent in Chiang Mai. 1. Small 100 – 125cc – 500 scooters. 2. Honda Phantom 250 cruisers. 8. Honda CRF250L. Released early 2013. 10. Honda CBR500R. Released early 2013. 11. HondaCB500X. Released early 2013. 12. Honda CB500F. Released early 2013. 13. Honda CB650s. Released May 2014. 14. Honda Africa Twin 1000. Released 2016. 15. Suzuki V-Strom 650s. Released May 2014. 16. Yamaha FZ 09. Released mid 2014. 17. Yamaha Bolt 950. Released mid 2014. Sporty riders might like to rent the Honda CB650F for a blast around the countryside. you are most comfortable on. Think about the type of riding you enjoy most & like to do, then pick a bike that is available, & affordable to satisfy that need. Small bike or big bike: note that it is not necessary to ride a big bike to enjoy yourself & take in the scenery. Ride a big bike fast & you need to watch the road more, you see & will learn less because you travel faster & are less inclined to stop & take photos. Generally for first timers, one up, a smaller (a 250) is better if you want to take it easy, potter around, take photos & enjoy the people & villages en route. Riding at 60-80 kph a 250 is a better bike to ride than a 650. Ride faster than 80 -90 kph & you need to watch the road & not the scenery. So go slower & take a 250! Plus the 250s are incredibly fuel efficient. But wanna go faster & rack up the kilometres & not see as much or stop & take photos, then take 650. And if you are two-up then a 650 is maybe the way to go. 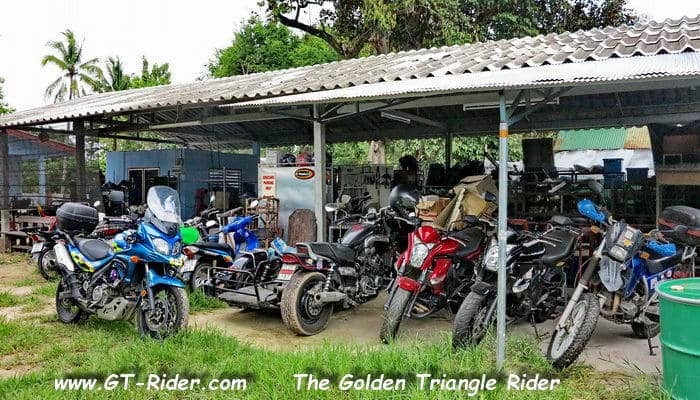 Read on GT Rider how someone did it all the way from Singapore – the Golden Triangle & return on a KSR 110cc. Riding a little KSR from Singapore to the Golden Triangle! Read these tips on Traffic & Roads before you set off from the rental shop. A Kawasaki 650 Versys or a Suzuki Vstrom 650 should be the choice for the touring rider, especially two-up. 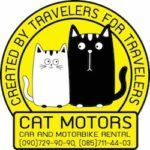 Cross border rental & travel – in Chiang Mai either C&P Motorcycle Rental or Pop Motorcycle Rental or in Chiang Rai ST Motorcycles & Chiang Rai Big Bike Rentals will let you take their bikes across borders. Get the best & break the bank – rent an Africa Twin from Pop. 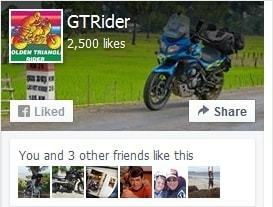 Check the GT Rider forum for the latest bike & shop info. 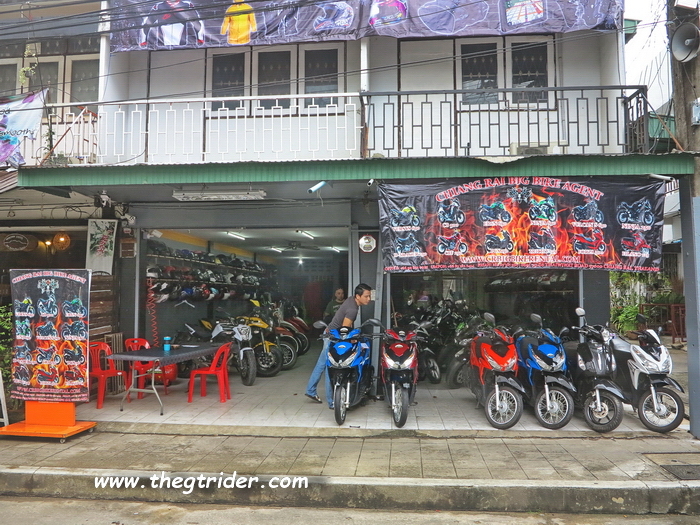 If you’ve already got your own bike & need some work done it, then check out the GT Rider list of Chiang Mai bike shops. 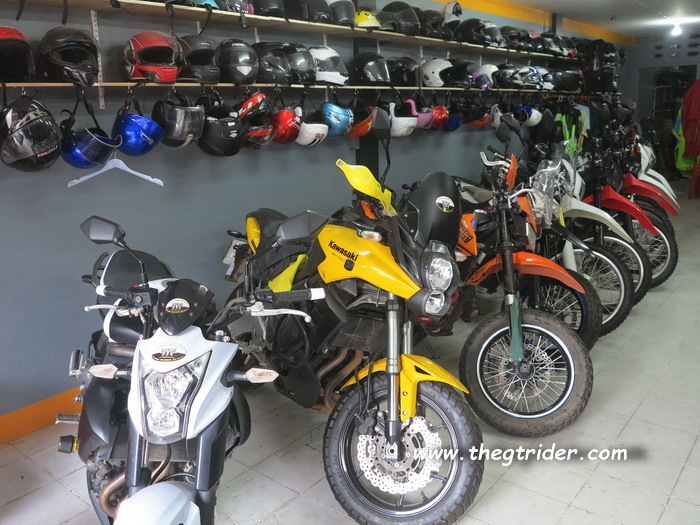 GT Rider also has a list of handy motorcycle related shops in the Chiang Mai area if you’re looking for parts & accessories for your trips. Serious big bike riders might want to bring their own machine, but come and rent a local bike first before jumping in at the deep end. Read about how to bring your own bike. To be satisfied with the bike’s reliability and comfort for an upcountry tour, test ride it before hand. Start with a run around the city moat, then if you are still not sure take it for a one day trip. The Samoeng loop is an excellent 100 kms half day ride from Chiang Mai, which everyone should do at least once, even if just to test out a bike. 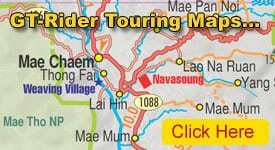 Take a Mae Sa Valley Samoeng Loop map with you & have a great day out. Can be negotiable, but if you bargain too hard for a bike the owner will probably give you the worst bike in the shop and keep the better bike for someone else who wants to pay more money. A cheap rental price might only mean a cheap bike that costs extra money for fuel, repairs and heaps of worry while on tour. Hire prices in Chiang Mai are very cheap with most of the shops struggling to survive in low season. So, take care of your bike, don’t try to screw the shop owner, and they’ll be there when you come back next time. PASSPORT SURRENDER When you hire a motorcycle you must surrender your passport to the shop as security for the bike. As the bike is not insured, your passport is the insurance for its return. When the shop has the bike back to their satisfaction, your passport is returned. 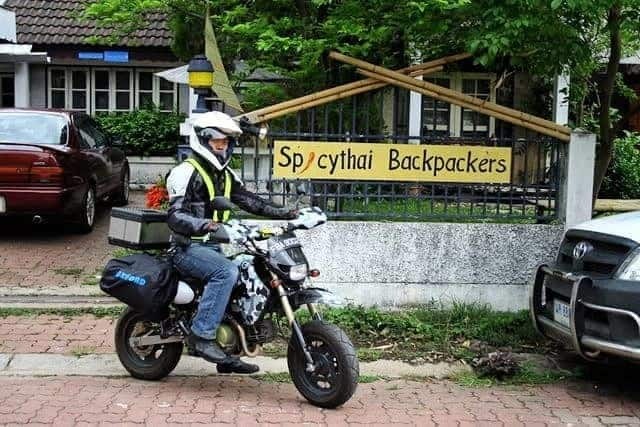 This hiring condition might alarm first time visitors, but it is standard practice in North Thailand and there is seldom a problem recovering your passport, provided you bring the bike back. Note too that motorcycle theft is not a real threat to deter you from hiring a bike. If you do experience any difficulty recovering your passport, don’t waste time with the shop – call the Tourist Police. 1. C & P Service. 21-23 Chiang Mai Lamphun Road. Wat Gate. Chiang Mai. Tel 05 3273161 / 088 54679786. C&P Motorcycle Rental. Smart & clean. 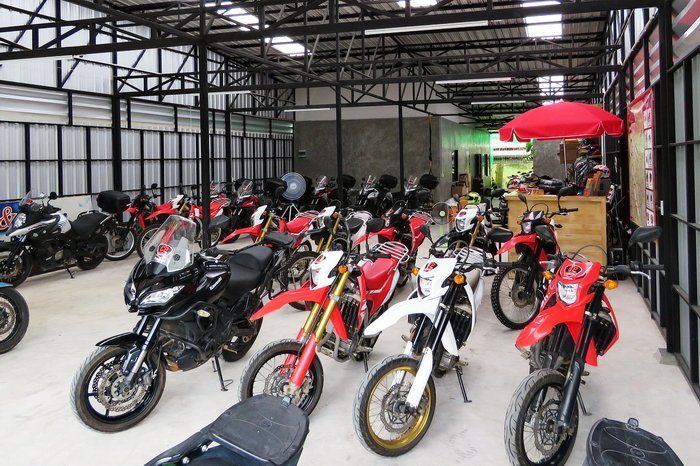 20 x Honda CRF 250L & 250M @ 800 baht per day. 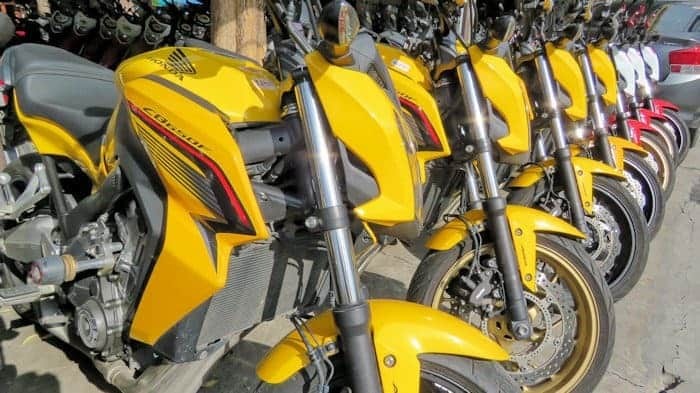 7x Honda CB 500X @ 1,300 baht per day. 3 x Honda CB 650F @ 1,500 baht per day. 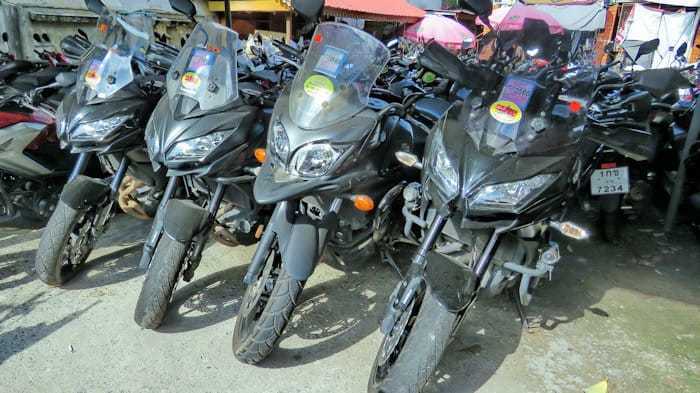 4x Kawasaki Versys 2015 @ 1,800 baht per day. 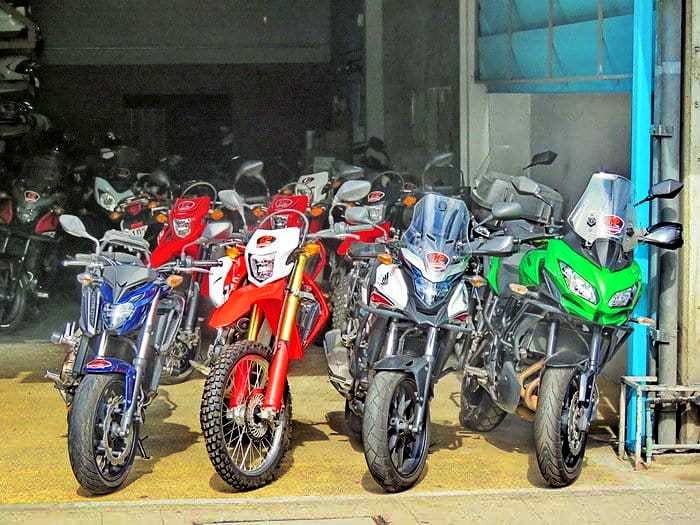 5 x Suzuki V-strom @ 1,800 baht per day. Comments: Recommended for the best off-road bikes in town. C&P will let you take a bike to Laos. 3 x Honda XR250 2005 model (upside down forks) @ 1,000 baht a day. 1 x Honda AX1 250 @ 800 baht a day. 1 x Kawasaki KLX 250 @ 1,000 baht a day. 4 x Kawasaki ER6N @ 1,200 baht . Joe’s rental & workshop for big bikes. 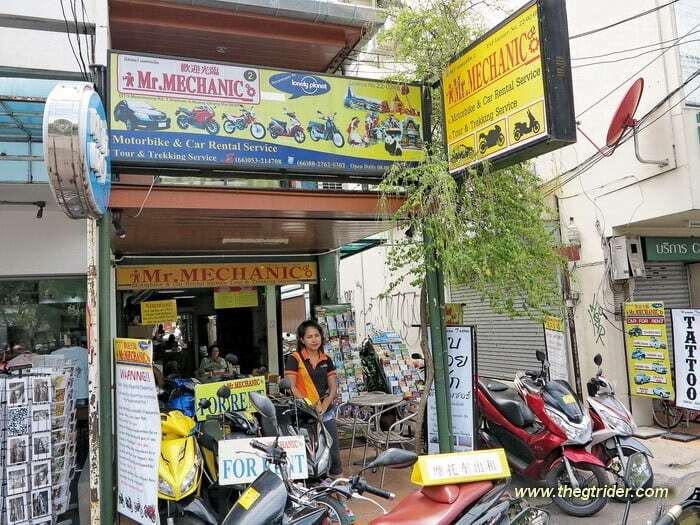 Comments: This is the number one expat big bike service shop in North Thai. Bikes serviced by German Joe, the expat expert, & generally more reliable. Break down service: Joe’s got a powerful sidecar (Kawasaki VN1500 motor) for breakdown pick-ups, and they’re an awesome pair on the road at times. Prices start at 300 baht inside Chiang Mai city. Up country pickups cost 500 baht + 7 baht per kilometre. Ring Joe 081 033 6937 to check availability. Sundays not available. Other days depends on work load in his work shop (rental customers come first) so he may not always be able to respond immediately. Comments: some mixed reports, but generally acceptable. Mr Beer is an interesting character. 5. Mr Mechanic. 4 Soi 5, Moon Muang Road. Tel: 053214708 / Mobile 018824402. Chiang Mai 2nd biggest biggest rental fleet; run by the vivacious Ms Gung, Miss Ying, Miss Yui & Miss Ploy. 4 x Kawasaki ER650 @ 1,200 baht a day. 1 x Kawasaki 650 Ninja @ 1,200 baht a day. 2 x Honda Steed 400 @ 800 baht a day. 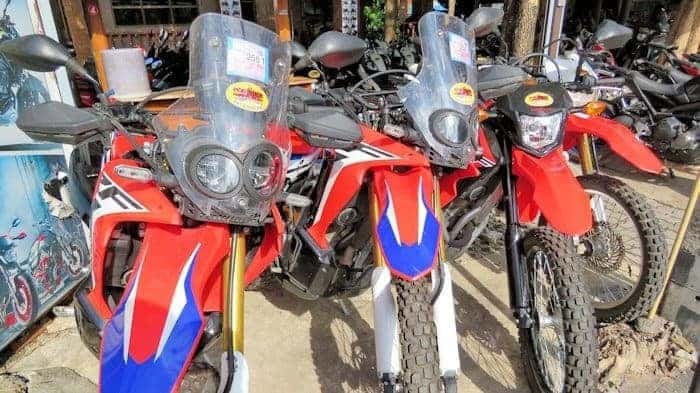 3 x Honda XR 250 @ 700 baht a day. 4 x Kawasaki KLX 250 @ 900 baht a day. 2 x Kawasaki D-Tracker 250 @ 800 baht a day. 7 x Honda Phantom 200 @ 700 baht a day. 18 x Honda Dream 100cc @ 170 baht a day. 49 x Honda Dream 125cc @ 200 baht a day. 2 x Honda Sonic 125cc @ 250 baht a day. 9 x Honda Wave 110cc @ 170 baht a day. 5 x Honda Click Automatic 110cc @ 250 baht a day. 4 x Suzuki Hayate 115cc @ 300 baht a day. 5 x Suzuki Step 125cc @ 250 baht a day. 2 x Yamaha Mio Automatic 115cc @ 200 baht a day. 1 x Yamaha Nuovo 125cc @ 300 baht a day. Comments: The 2nd biggest bike fleet in town. Recommended for excellent friendly service & the best long term rental deals in town. 53 Kotchasarn Road. Tel 053-276660 & 081-032929. 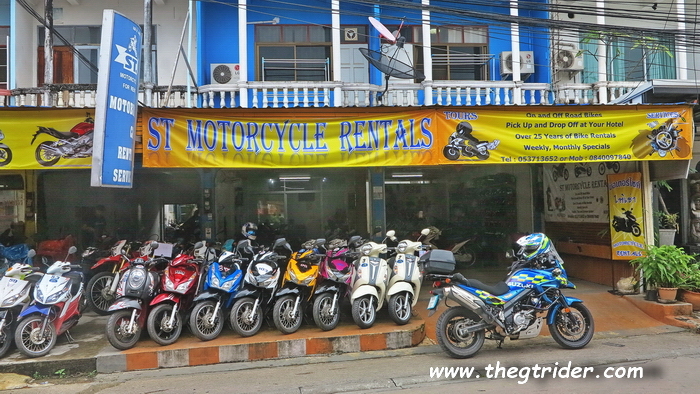 The biggest fleet of rental bikes in North Thailand. Pop will let you take a bike to Laos. 7. Tony’s Big Bikes. 17 Ratchamankha Rd. Tel: 053207124. 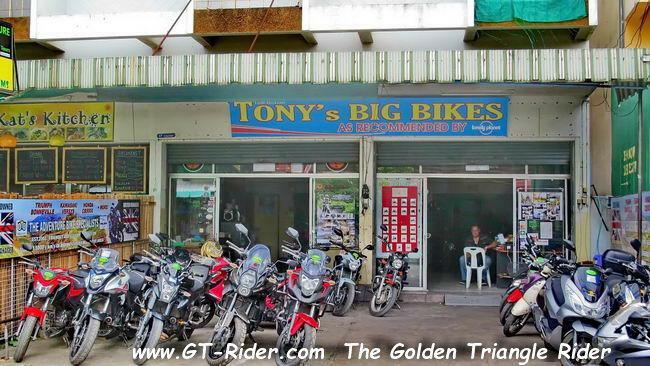 All of Tony Big Bikes’ bikes of 500cc and over are fitted with genuine Pirelli Tyres (Scorpion Trail 2 and Angel GT and Rosso 2), D.I.D X ring Gold chains(genuine Japanese imports) and OEM genuine brake pads. These are fitted to give more confidence to customers with the knowledge their bikes are in top condition & well maintained. The shop has a good variety of well-maintained bikes and is run by a couple of knowledgeable expat bikers with a lot of local miles between them. If you want trip advice with a dose of Brit humour as well as a decent bike, this is the place to go. 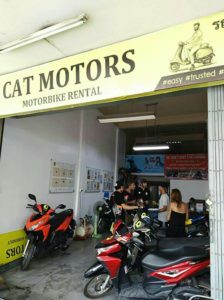 Cat Motors office is within easy walking distance of the historical city center of Chiang Mai’s Old City. Opening Hours: from 8:00 to 18:00 without weekends and holidays. 1. ST Motorcycles. 1025/34-35 Jed Yod Road. Chiang Rai. Tel: 053713652. 053752180. Mobile: 087 926 6100. ST will let you take a bike to Laos. 11 x Versys 650cc @ 1,700 baht per day. 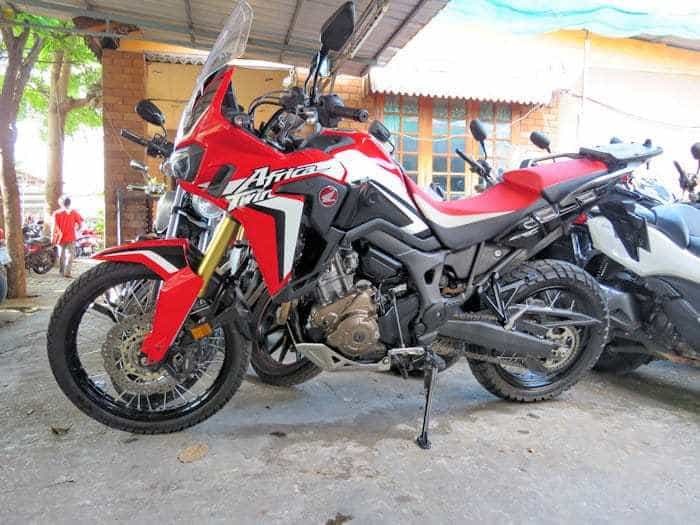 5 x CB500X @ 1,500 baht per day. 3 x Ninja 650cc @ 1,500 baht per day. 3 x ER6 650cc @ 1,500 baht per day. 2 x Vulcan S 650cc @ 1,700 baht per. 2 x Ninja 250cc @ 800 baht per day. 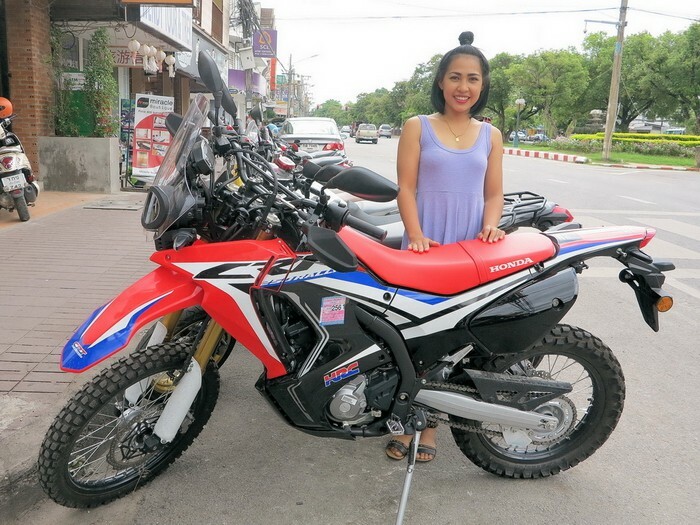 13 x CRF 250cc @ 800 baht per day on road. 1,200 baht per day off road. 2 x D tracker 250cc @ 800 baht per day. Motard. 1 x Dtracker 300 @ 1,000 baht per day. 8 x PCX 150cc @ 300 baht per day. 2 x Tri city 125cc @ 350 baht per day. 20 x Filano 125cc @ 250 baht per day. Chiang Rai Big Bike Rentals will also let you take a bike to Laos.